Do States Have the Right to Exclude Immigrants? States claim the right to pick and choose who can come to their country to live and work. They put up barriers and expose migrants to deadly journeys. Those who are lucky enough to survive are labelled as ‘illegal’ and find themselves vulnerable and unrepresented. Meanwhile, the international state system advantages people lucky enough to be born in rich countries and locks others into poor and often repressive ones. 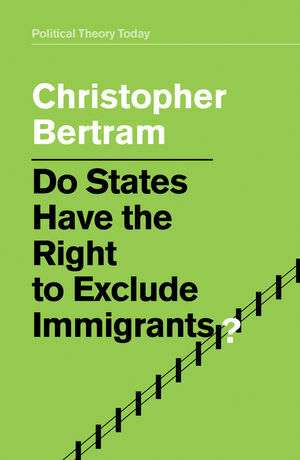 In this book, Christopher Bertram skilfully weaves a lucid exposition of the debates in political philosophy with original insights to argue that measures that control human movement across borders must be justifiable to everyone. If states are to claim legitimacy, they need to work with other states and migrants themselves to create a migration regime that is fair not only to democratic electorates at home, but also to would-be and actual immigrants. Until justice prevails, states have no credible right to exclude and no-one has a duty to obey their immigration rules. Bertram’s analysis powerfully cuts through the unhelpful fog of political rhetoric that surrounds this most controversial of topics to clarify the moral and political issues at stake. It will be essential reading for students, scholars and general readers interested in the politics and ethics of migration. ΓΙΑ ΝΑ ΜΗΝ ΞΑΝΑΠΕΙΣ ΠΟΤΕ…ΜΑ2 ΠΕΙΝΑΩ!